The 2017 international Cup will see Pakistan competing once again as the Shaheens, a team that was to be selected from across Pakistan and not so much as the 2014 Pakistan Shaheens who were largely Melbourne based Pakistani nationals. Unfortunately though, only four of the players training in Pakistan were granted visas. Another five that as far as we know were not part of the training squad in Pakistan have also made the trip as part of the team. 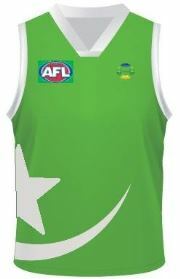 Australian football has been played in Pakistan since 2006, starting with the creation of the Australian Rules Football Federation of Pakistan, based in the city of Mingora, Swat Valley. Mingora is probably one of the most unlikely of places to establish Australian Football with the Swat valley being in the Northern extension of Pakistan at the base of of Himalayan mountains sandwiched between Kashmir and Afghanistan. Mumtaz Ali Khan was instrumental in setting up the initial footballl competition through the Tanzeem-E-Insidad-E-Manshyiate organisation (TIM) and being the TIM organisation's first President. TIM is a group combating drug use through seminars, medical centres and sporting tournaments. May 2006, the city of Mingora, hosted a tournament held by the Tanzeem-e-Insidad-e-Manashyiate organisation between 4 school and college-based teams. Mumtaz Ali Khan said that his organisation, TIM, has been using sport as a tool against drugs in society since 2001-02. 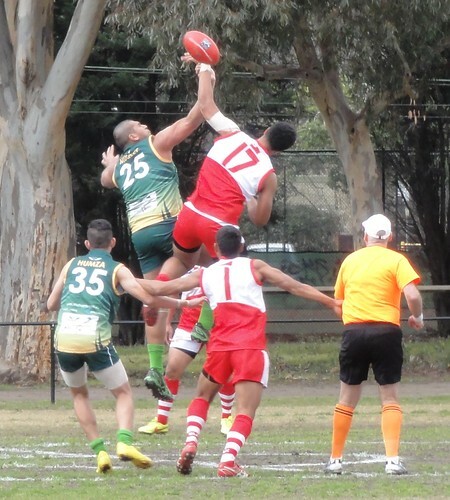 The connection to Australian Rules stems from his having once seen the game on television via a sports channel, becoming interested and deciding to begin the game in the Swat area, beginning with school and college level students. The group approached Aussie Rules International for balls and other materials. Four sides representing the Tanzeem-e-Insidad-e-Manashyiate (the Swords), the Swat Public School (the Eagles), the Jehan-Zeb College (the Dolphins) and the Government High School No3 (the Bulls) resulted. June 2006, the Swat Continental Hotel in Mingora, hosted the 'Seminar for the development of Australian Rules football in Pakistan' run by Mumtaz Ali Khan, and attended by the federation's executive members, school and college-level students and numerous volunteers had an underlying theme of 'helping youths resist drugs'. During the seminar, Mumtaz Ali Khan expressed his thrill that Pakistan had joined the growing list of football-playing nations. They had a four-team High School/College competition, regular fixtures and around 100 players on their lists. In another positive, Naeem Ullah Khan, General Secretary for the Federation, announced that football would be used to preach peace in the area, with plans to spread the game to nearby Afghanistan, Kashmir and Central Asia. It is also hoped the sport would foster Australia-Pakistan relations. Mumtaz Ali Khan thanked the many people who have been involved with the game to date, but stressed that they still faced an uphill battle and that greater assistance was needed in maintaining and growing the sport. November 2006, Mumtaz Ali Khan opted to vacate the role of President and take on a more active role as Programme Development Officer, in the hope of further encouraging the sport's growth throughout Pakistan. Habib ul Haq, Vice President at the time, took up the role of President. Two more clubs had been established, one in Peshawar (the Colours) and one at the University of Malakand have joined the four team round-robin competition in Mingora, where four clubs attended. Plans were made for mirror competitions elsewhere in Pakistan and in Afghanistan and Kashmir. That made for 6 football teams in Pakistan at the time, all located in the North-West Frontier Province. Five of those are based around educational institutions. In 2007, the ARFFP changed their name to AFL Pakistan. It was hoped that this new name and image would make them a more attractive organisation to potential sponsors. August 2014 The Pakistani national played their first international game against India at the International Cup. 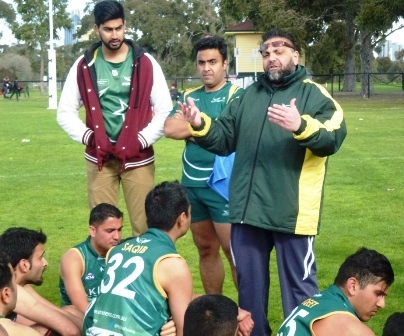 The match was won comprehensively by Pakistan's Shaheens, a Melbourne based squad. read a HindustanTimes account here. It is tradition for national sides to have a nickname and the name Dragoons was chosen by AFL Pakistan's former president, Mr. Mumtaz Ali Khan. The name recognizes the Pakistani Army, which maintains armoured regiments with the titles of Lancers or Horse dating back to the nineteenth century. It represents both the strength of the football side, the courage of the players and their place in a sport with a very detailed and rich history, also dating back to the nineteenth century. November 2014, Tayyab Chattha and others effectively rebooted AFL Pakistan with help of the Australian High Commission Islamabad staff. A number or tournaments were held in 2015 culminating in the first National Championships. 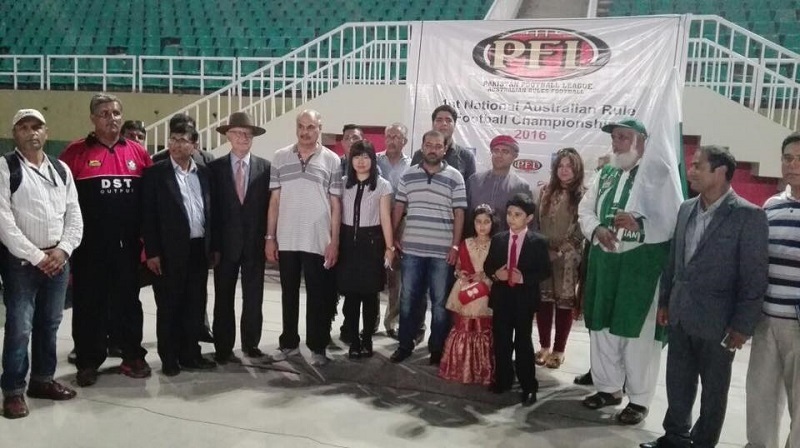 The 1st National Australian Football Championship of Pakistan where held on 27th~28th October 2016 played at the Jinnah Stadium ,Pakistan Sports Complex Islamabad. Ten teams from all over Pakistan participated. The final match was played between the Islamabad Tigers and the Rawalpindi Lions. In attendance was the Australian High Commissioner to Pakistan as chief guest and well as the Ambassador of Tajikistan, the Ambassador of Portugal and diplomats from Russia, Brazil, Oman and other dignitaries. Kashif Bouns presented the cup on behalf of the AFL and he also did commentary on the match. The final match was live telecast on Pakistan National Sports TV around the world. The Islamabad Tigers starred on their first outing showing fabulous clean ball skills, gut running and determination to overcome the Rawalpindi Lions in a close final by 34 to 30 points. There were 15 club football in Pakistan at the time, all located in different cities, 4 clubs in Islamabad, 4 clubs in Rawalpindi 2 clubs in Gujranwala, and also including 4 girls club. Prominent clubs are: Islamabad Tigers, Islamabad Rising Stars, Junoon AFC, Rawal AFC, Morghah Queen AFC, Gujranwala AFC, Haiderabad AFC, Faisalabad AFC and Lahore AFC. Pakistan, in the eyes of Westerners. is one of the lesser known countries. Few people appreciate the rich history of Pakistan which has been ruled by numerous empires and dynasties, including the Persian Achaemenid Empire, Alexander of Macedonia, the Indian Mauryan Empire, the Arab Umayyad Caliphate, the Delhi Sultanate, the Mongol Empire, the Mughal Empire, the Durrani Empire, the Sikh Empire, and most recently, the British Empire. Most people are unaware of the bloody split from India in 1947 that resulted in millions of deaths in the creation of East and West Pakistan. West Pakistan became Pakistan in 1971 with the Independence of East Pakistan to become the country of Bangladesh. Geographically Pakistan consists of the Indus River Basin that collects water from the Himalayan Mountains and transports it to the rich Indus Delta before entering the Arabian Sea. The name "Indus" gives rise to the name "India" and the Punjab is a large part of Pakistan as well as a part of India. As stated earlier, this team is largely the Australia based Shaheens from 2014, so we would expect them to be of a similar standard. With the addition of a few Pakistan based players this should not change the strength of the team too much. They will be very competitive in second division against Germany and Japan and would back themselves against India after their previous IC clash where they won easily.